Grandma’s incredible, classic buttermilk waffles are made with simple ingredients for the fluffiest homemade waffles that are perfectly crispy on the outside. Top them with fresh berries and a drizzle of pure maple syrup for the best breakfast or brunch! I’ve always wondered why I am in love with everything that’s breakfast related…or you know, just obsessed with food in general. I think I finally found the answer after visiting my Grandmother and spending time in the kitchen cooking with her. I’m now quite convinced that a love for food has been passed down to me. I know that it’s something that will be apart of me forever. In fact, cooking for others is absolutely my favorite thing in the world. My grandmother is Puerto Rican, so much of the food she cooks tends to be Spanish inspired; my Nana (Great Grandmother) taught her how to cook everything from scratch when she was a young girl. Ever since then, it’s been one of her favorite things to do. When my Grandma isn’t making homemade pozole, empanadas, and arroz con pollo, she is usually baking muffins the size of my face or throwing together a ridiculous continental breakfast. Seriously give her a half hour and she’ll make you an incredible meal, but provide her with a couple of hours and you’ll have a masterpiece to eat. She treats every meal she makes with affection, putting the utmost love into her creations; it’s an extraordinary quality. She pours her soul into stews and she throws her spice for life into spanish rice. Cooking is like an expression to her, and everything is always made with love. My Grandma and I are two peas in a pod. I admire her in every way. I love her best though when she’s making me brunch, which often includes her famous yet classic buttermilk waffles. Crispy on the outside, warm, fluffy and perfect on the inside. Any type of milk – even your favorite non-dairy milk! Add 1 tablespoon of freshly squeezed lemon juice or white vinegar or every 1 cup of milk. Let the mixture sit for about 5 minutes until the milk begins to curdle, and then it’s ready to use! 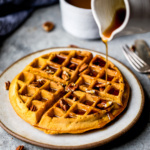 You can use buttermilk in tons of baking recipes, but my favorite way to use it is obviously in these incredible homemade buttermilk waffles. Can I use regular milk instead of buttermilk? Yes, just add a tablespoon or fresh lemon juice or vinegar to your milk before using it in this recipe! 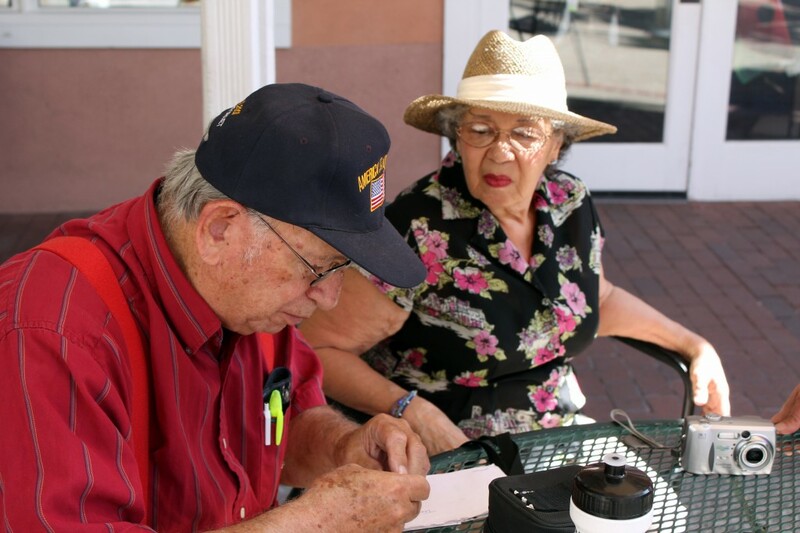 This is a picture of my Grandpa & Grandma. They were the ultimate romantics. Unfortunately, my Grandpa passed away a few years ago. I specifically remember this moment though. My grandpa was attempting to fix my Grandma’s watch after it suddenly broke while we were out. He made it his mission to repair it immediately himself, walking to every shop nearby to see if they had a special pin for the band. Sure enough, he found one! They both took care of each other and I think that’s pretty incredible they were going strong for nearly 60 years. Cuties. As I’m writing this, I’m fondly remembering the morning my Grandmother made these waffles for us, partly because they are the best waffles I’ve ever had. It was Mother’s Day and we all enjoyed a breakfast full of eggs with green chile, pastries (ugh, SO MANY PASTRIES), waffles and of course, coffee. As I was spreading peanut butter on my waffles and drenching them with syrup (best combination ever), I looked around the table and thanked God for my amazing family. They’ve taught me so much: to cook, to be determined, to laugh, to love, and to absolutely never give up! Now I’m the one pouring my heart and soul into the food I cook: whipping up pancakes with such care, crafting a skillet chicken (with pepperoni sauce) that only kids could adore, and browning lots of butter for the best chocolate chip cookies (the way to win anyone’s heart). Cooking is my romance and I’m bringing it to you. I hope you’ll stay awhile and eat some ridiculously good waffles with me. With butter, syrup, and whatever else your heart desires. What’s the difference between buttermilk waffles and homestyle waffles? I love making homemade buttermilk waffles because they’re lighter, more airy, and fluffier than traditional homestyle waffles. You’ll love the crispy outside of these thick buttermilk waffles paired with the tender, warm inside. To make waffles extra crispy, you can either toast them after they come out of the waffle iron or you place them on a rack in the oven at 200 degrees F for 5-10 minutes. I find the best way to reheat homemade waffles is to put them in the toaster! This allows them to keep their crispy edges and fluffy insides instead of getting mushy from the microwave. You can also put them in a 200 degree F oven and toast for 5-10 minutes. 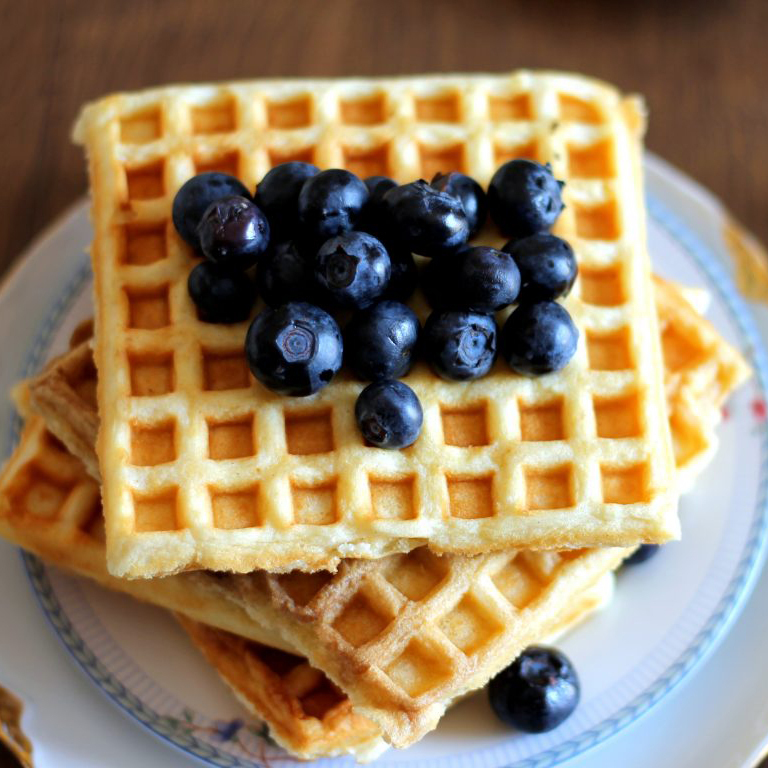 If you make these waffles, please take a moment to leave a comment and rate the recipe below! xo! 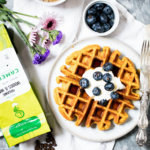 Grandma's incredible, classic buttermilk waffles are made with simple ingredients for the fluffiest homemade waffles that are perfectly crispy on the outside. 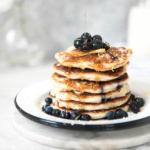 Top them with fresh berries and a drizzle of pure maple syrup for the best breakfast or brunch! Preheat waffle maker. Spray generously with nonstick cooking spray or generously grease with butter. In a large bowl whisk together flour, baking powder, baking soda, and salt. In a separate large bowl, whisk together the buttermilk, eggs, melted butter, vanilla, and sugar until blended. Add dry ingredients to wet ingredients and mix until just combined. Pour batter into a preheated prepared waffle iron; cook according to manufacturer's directions or when steam stops. 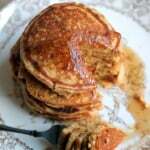 Top with maple syrup, peanut butter, honey, or fresh fruit preserves. You can add in additional ingredients such as: 1 cup fresh blueberries, 1/2 cup coconut, 1/2 cup mini chocolate chips, dash of cinnamon, or whatever you'd like. I always spray my waffle iron with cooking spray before cooking each batch, I recommend doing the same. 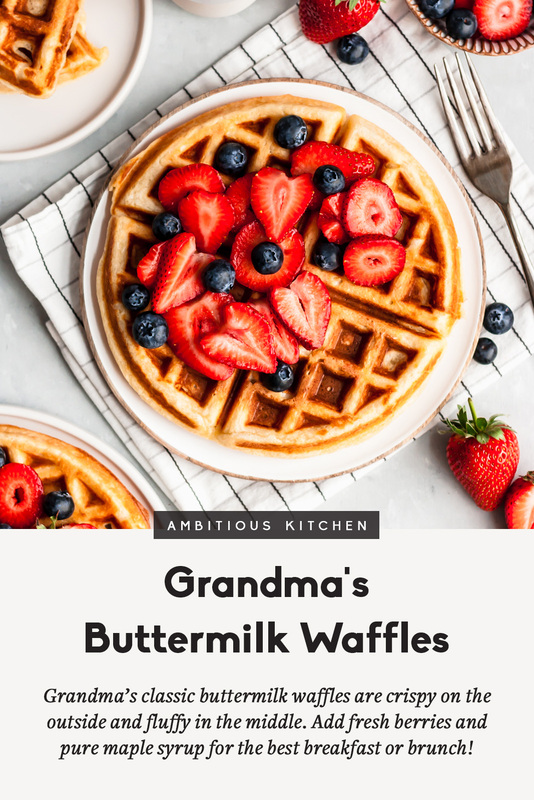 36 Responses to "Grandma’s Buttermilk Waffles"
This is a beautiful blog and your photos are great! Your grandparents are adorable! And the waffles look delicious! I know, aren’t they so cute? You are so sweet and so is this post. I am sure your Nana is so proud of you and your recipes. Indeed, your future hubby is one lucky man. He’ll have grand feasts for breakfast. Yum! Ahh! I eat peanut butter and syrup on my waffles too! My uncle introduced me to that combo back when I was a kid, and everyone always thinks it’s so weird, when it’s actually AMAZING. This is such a sweet post! If I wanted to use regular milk (out of buttermilk, whoops!) what would I have to change to make this recipe work? 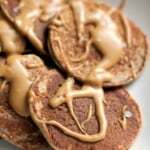 I made these this morning, and they were amazing! Thanks for the great recipe. Definately a keeper! Just made these and tasty tasty is all I can say! Super easy to mix up and my 3 year old is devouring them :O) We chopped up some fresh strawberries and mixed them with a little brown sugar. A.Maz.Ing!!!!! Your Grandma knows what she’s doing! What a great post. 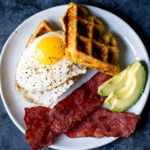 And amazing waffles – I’m making this for Sunday brunch! Delicious! They are the first waffles I tried at home! Made these today !! Extremely crispy and tasty !! I am ditching my usual recipe in favor of this one !! I didn’t have butter so substituted with 4 spoonfuls of canola oil. Thank you for sharing the recipe. I was searching for a recipe to try my waffle maker for the very first time. And I have a winner 😊 Just a quick question. I’m missing a step in the instructions whether the dry ingredients go info the wet ones oř vice versa. Thank you. All fixed! 🙂 Thanks for catching that! Hi Monique, I followed your instructions and took whole milk with lemon juice, that worked fine and as you promised, inside fluffy, outside crunchy, not too sweet – we deeply fell in love with them. Thanks for the recipe, it is really amazing! Hi Jutta! Thank you for your note 🙂 I’m so glad you loved these. The perfect brunch!